Until now I've kept a fairly consistent schedule of writing every other day for nearly the last 4 years. But astute readers may notice that I've been a little delinquent in my postiness lately, and I thought rather than just stay hidden without explanation, I'd pop my head up and give you an update - just so you didn't get worried and send Jack Malone out looking for me. Unless you sent Sam Spade instead. Then I suppose it'd be ok.
No kidding. St. Cloud has partnered with a quaint little town in southern Bavaria called Spalt, an area where most of this region's ancestors hail from, and our two communities have claimed each other as "sister cities." What this means is that every other year or so, people from Spalt come here to visit and the following year we go there. 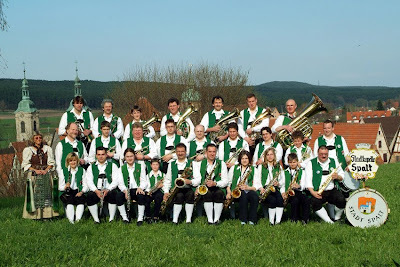 Normally, a few dozen folks make the journey, but this year, the Spalt Stadtkapelle Municipal Band came along to bring the total delegation up to 75 people! That meant that St. Cloud needed a boatload of people to help house everyone, and we were lucky enough to get 3 wonderful brothers who are also part of their band. The band has been around for over 400 years and it shows. They practice every single week and take their music very seriously. Every note is perfectly played and you can sense the pride the members have in their music and their representation of Spalt. Over the last week we've had a total blast showing them the sites of Minnesota, immersing them in "American" activities and exploring our cultural differences and similarities. We couldn't have ended up with better guests and all of us have bonded very closely with these guys. It's going to be sad to say goodbye on Tuesday. So that's what I've been up to lately. In a few days I'll be opening up Virus Stompers for business, and I'm hopeful that you'll all help me promote it. I'm thankfully still employed and our company is hanging in there, so hopefully we'll pull through. In the meantime, please don't forget about me. I should be back online on a regular basis very soon! Oh, that sounds so cool. I bet you all had a blast. You weren't tempted to veer off into "The Germans" routine from Fawlty Towers, were you? Very excited for the launch of Virus Stompers! Not thirty minutes ago I was telling Jess I was a little concerned because I hadn't heard from Bill and Lois and you hadn't done a blog post in a long time. I was actually going to call Lois to see if everything was okay. Glad to hear you have been having fun with Germans! There are few things more soothing than drifting off to sleep, to the sound of tubas playing Germanic Ommp Pah Pah lullabies. How COOL with Spalt. I love Germany and the way out in the middle of nowhere Germany (like Vilsbiburg where I spent two weeks and was the only English speaker there... and no, I don't speak German). What a fun and neat thing. I wish they did stuff like that where I am! welcome German people! So glad you got such a great host family to stay with! You will be life long friends!! Enjoy your visit! If your taste of foreign youth gave you an inclination for exchange students, let me know and I can set ya up. mom - Yes. We are all enjoying ourselves a lot. It's been a great experience. jd - Are you kidding? We've unleashed every stereotype we can think of on these guys. I can't even imagine what they say about me when they're talking to each other in German. mom thumb - So sorry I haven't been keeping in touch. This has been a very odd Spring. rick - One of the boys here IS a tuba player. I'll have to ask him to play a lullaby. sis - You're absolutely right. These are the nicest people you'll ever meet. I anticipate a long friendship with them. gette - Uh... let's not jump to conclusions now. 10 days is one thing... a whole year is another. Sounds like a neat program. Glad you're having a good time! So there is a program by which one can have handsome young men come to your town and hang out? And play music? And I think to myself...what a wonderful world. You better watch out...I invited a Danish guy into my home one day and he never left. I'll bet you bought all the brats and sourkraut in town. Remember, they are too young for beer. Har JD! I now have the image of John Cleese goose-stepping all over the place! Bill, Legal drinking age in Germany is 16!!! So it has been loads of fun covering my children's ears as they discuss stumbling home at 3am when they are home in Germany. We didn't make ONE thing that was German-like, they had one meal at a restaurant that was kind enough to host a free German meal (for the delegates) and they came home saying "ewww those sausages were just terrible, just terrible" We just laughed, so we made sure not to compete with meals from back home. Sunday night the boys bought and prepared an entire comfort food meal from Deutschland all by them selves - it was wonderful!!! Yes I was worried. Glad to see you are having fun. 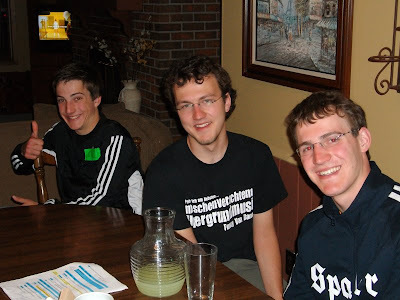 When I was a teen we hosted students from Spain and Paris for several summers. It was a lot of fun. Yeah, it was a great time staying at the Lee's. I'm Stefan the 16 year old stumbling home at 3am from the beer party and the one who plays the barytone in the Spalt Band - named 'Stadtkapelle Spalt'. I must say the Lee's are the greatest and the most wonderful host family where we could stay during our time in the USA. It was a time I will never forget and I can't thank all of them enough! And if you all want to taste the German way of life and the excellent Spalter Bier (the Spalt beer) you must visit us next year! We are all looking forward to see our friends from St.Cloud again! elizabeth - It's a great program for sure. I'm really looking forward to our visit over there! ve - That's easy for you to say... If only *I* was in retirement at an early age. Wait... I'd better be careful what I ask for. shieldmaiden96 - Ya, who knew? bill - I wouldn't even dream of trying to cook German food for them. But we did get some VERY tasty food FROM them! maureen - You're right. I believe their grammar is much gooder than ours! charli - Amen to that. Now I'm craving their delicious nudelkasserolle. windyridge - It sure was fun. These guys were a true pleasure to have at our house. Stefan - Hey, glad you are home safe and sound! I already miss you guys. I sure wish it was easier to visit on a regular basis. We are going to try our hardest to come there next year for sure. And thanks for stopping by to leave a comment, but I'm curious... how did you know about this blog? STEPHAN!!! Hello! I am so glad you made it home safe, it just isn't the same here without you. Send us an email updating the remainder of your trip when you get a minute. We really had a great time! Take care sweetie. And the Receders will be visiting Spalt next year?